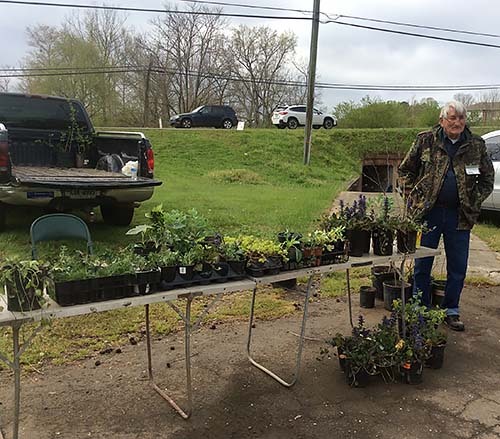 Sherman Smith of Fairmount brought a nice variety of plants for your landscape. For those in the know, they know where to go, Jasper’s own Farmers Market! Another beautiful day of happy vendors and customers with various goods like vegetables, bread, herbs, jewelry, craftwork, and home décor. Couldn’t help but notice the wonderful choice of baked goods available from several vendors. Jackie’s Friendly Baking offers fresh baked bread, English muffins, cranberry walnut millet bars, plus, granola, Amish cinnamon bread, as well as Ezekiel bread. Pappa’s Bakery had those oh-so-wonderful cinnamon rolls along with other choices. Cakes, cupcakes, and many other delicious choices could be found with other vendors as well. Jean Schilling had fresh bread offerings, plus herbs like thyme and pennyroyal. Jean is a Master Herbalist with lots of information about herbs and their health properties. She also had a special soap made from common plantain that will treat poison ivy and other itchy problems from the garden. The soap can be used to help prevent mosquito bites! That’s a lot of value from one bar of soap. Several customers headed back to their cars smiling as they carried away beautiful plants like Giant Ajuga with it’s royal purple blooms from vendor Sherman Smith. He had a variety of choices including some herbs, oak leaf hydrangea, and yellow flowering Archangel. Ever enthusiastic, Camille Morgan, offered a multitude of succulents in recycled containers along with her many choices of other plants. Natasha Kalbalkin and her mother had several choices of plants in hypertufa containers and an unusual gooseberry cross with deep purple berries. Another vendor, Irina Voronia, had succulents in hypertufa planters as well. Plus, she offered the most unusual white pine strawberry plants. Like the traditional strawberry the seeds are on outside, but the berry is white! She says they have a pineapple taste. For those who like to try new things in their garden, this one sounds wonderful! Hypertufa planters look like cement containers but are lightweight which is one advantage. Irina says they also hold in moisture, unlike a clay pot, and are breathable, which is good for the plant’s roots. The Master Gardeners of Pickens County will be offering a hands-on class later in the year for making hypertufa containers to take home. Until that time comes the MG’s will be offering other events and classes throughout the year. This includes our Master Gardener’s Farmers Market Program every 2nd Saturday of the month. Next Saturday will be our first program offering called “Spring to Fall Spectacular Waterwise Perennial Garden” led by Diane Nelson. Keep in mind, “Year Of The Pollinator”. There will be a great Monarch butterfly program coming in May. You don’t want to miss it! Please come by the Master Gardener’s tent for some great information. Plus, we will have various plants from our own gardens for a donation that helps the 4H program. Thank you for support of our local Farmer’s Market! See you there!